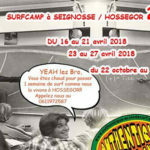 Throughout the year, according to weather condintions and tides, we will select with you the ideal beach for the lesson between Seignosse, Hossegor, Capbreton. In our surf camp, also the southern part of the Landes and the Basque country. Always on the search for the best wave depending on the day’s condition, it’s with a mini-bus and a friendly, easy going, relaxed vibe, that our group sets off on the road in the Landes and the Basque country to find the most suitable spot and waves !